In 1827 Ghazi-ud-din Haider’s son, Nasir-ud-din Haider; ascended the throne. King Nasir-ud-Din Haider had a colourful court and he led a lavish even extravagant life. He had a strong belief in Astrology & Astronomy. This led him to set up an observatory at Lucknow ‘The Tarunwali Kothi’ which was bedecked with exceptionally good astronomical instruments. He added Darshan Vilas, an european style Kothi, to the Farhat Buksh complex in 1832. By the time of Nasir-ud-din Haider the Awadh govt. had started deteriorating. The administration of the kingdom was left to the hands of Wazir Hakim Mahdi and later to Raushan-ud-Daula. The King was busy in his debaucheries and inventing religious rites. He lived mostly in women quarters and even started dressing like woman. He reproduced a Karbala at lradatnagar for his place of burial. However his tyrannical rule was brought to an end in 1837, when he was poisoned by his own friends & favourites. Nasir-ud-din Haider died without an offspring and Ghazi-ud- din Haider’s queen ‘Padshah Begum’ put forward Munna Jan, as a claimant to the throne though both Ghazi-ud- din Haider and Nasir-ud-din Haider had refused to acknowledge him as belonging to the royal family. The begum forcibly enthroned Munna Jan at Lalbaradari. The British intervened and exploited the situation to their interest. They arrested both the begum and Munna Jan and arranged for the accession of late Nawab Saadat Ali Khan’s son, Nasir-ud-daula, under title of ‘Muhammad Ali Shah’, who promised to pay a large sum of money to the British for this. As Shuja-ud-daula functioned from Faizabad, he paid a lot of attention towards beautification and development of the town of Faizabad. 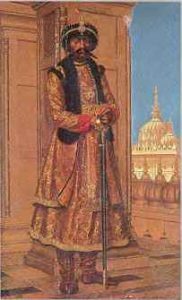 Shuja-ud-daula’s wife Bahu Begum, was a woman of great distinction and rank, who contributed significantly towards the growth and consolidation of her husband’s government. During the days of Shuja-ud-daula, Faizabad attained a prosperity, which it never saw again. Shuja-ud-daula died in 1774 and was laid to rest at his mausoleum at Gulab-Bari, Faizahad. 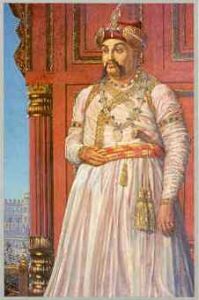 The accession of Asaf-ud-daula, the fourth nawab wazir of Awadh, brought a great change in Awadh politics. Under the rule of Asaf-ud- daula the court of Lucknow became utterly magnificent and the town of Lucknow acquired great splendour. The capital was finally shifted from Faizabad to Lucknow in 1755 which contributed to its significant growth. The most important outcome of Asaf-ud-daula consolidation of the court at Lucknow, was the emergence of a powerful shia culture, in constant interaction with the shia heart lands of Iran & Iraq. The increasing number of shia emigrants from Iranian cities varitably transformed Lucknow into a great intellectual centre. Asaf-ud-daula was also a great builder: He built the ‘Daulat Khana’ as a residence for himself to the west of Macchi Bhawan, the Rumi Darvaza and the incomparable Bara Imam Bara. The Imam-Bara & the Rumi-Gate were constructed as a famine relief measure in 1784. Consciously designed by its architect Kifayatullah, the 164 feet long and 52 feet wide building is constructed in brick with high quality limestone. The arched roof of the Imam-Bara, which is built without a single beam, is the largest of its kind in the world. The strength of the edifices can be judged from the fact that although built over 212 years they still stand intact, maintaining their original dignity and grandeur. The Bhulbhulaiya at Bara Imambara, is a unique labyrinth of intricate balconies and passages, with 489 identical doorways, which give the feeling of being lost. He also built the Bibiyapur Kothi. It was built by Asaf-ud-daula as a country residence where he frequently resorted for hunting, of which he was passionately fond. The beautiful Chunhat Khoti was also built by Asaf-ud-daula. General Claude Martin entered the court of Awadh under Asafud-daula, and created the plan of his ‘Constantia’, The Nawab was so overwhelmed by his design that he decided to purchase it with ten lakh gold coins. But before the transaction could be completed the Nawab departed for his heavenly abode in 1797, and was laid to rest in his magnificent lmambara. Yamin-ud-daula-Nawab Saadat Ali Khan was the son of Asaf-ud-daula. 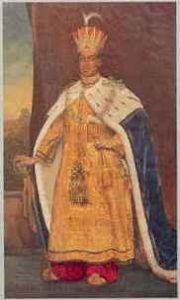 Saadat-Ali-Khan was crowned on 21stJan., 1798 at a grand darbar held at Bibiyapur Palace, by Sir John Shore. As a mark of gratitude he ceded half of Awadh Kingdom to the British in 1801. Saadat Ali Khan, though economical in fiscal management, was nevertheless an enthusiastic builder and commissioned many grand palaces, including Dilkusha, Hayat Baksh Kothi and Farhat Buksh Kothi as well as the famous Lal -Baradari. The Farhat Buksh was purchased from Claude Martin for fifty thousand rupees. Farhat Buksh was a vast complex of buildings. It remained the chief royal residence until Wajid Ali Shah built Kaiserbagh. The area was the scene of bitter fighting during 1857 and the complex was almost destroyed. 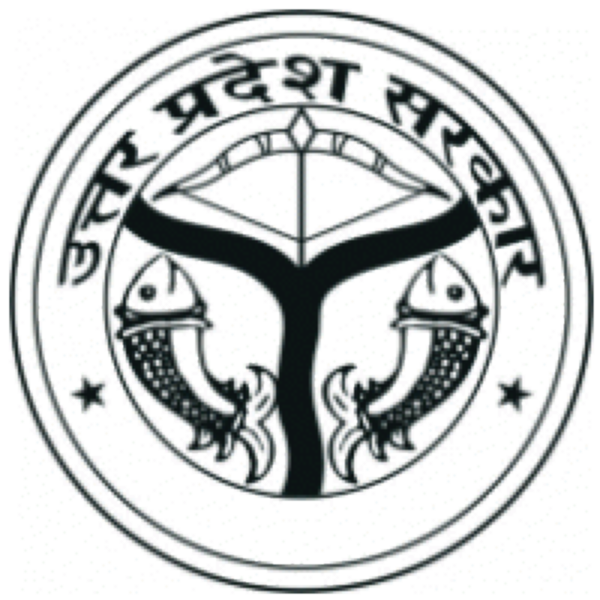 Chattar Manzil became a British club during the period of the Raj. Since 1947 it has been housing the Central Drug Research Institute. The Royal Court at Lal Baradari, the part of Farhat Baksh Complex known as ‘Qasr-uI- Sultan’, the King’s Palace, served as throne room, coronation hall of assembly for Awadh rulers, from the time of Saadat Ali Khan. Ghazi-ud-din-Haider was crowned in this royal Palace in 1819. The Kothi ‘Dil Aaram,’ was constructed on the high river bank as a private house for the Nawab. In addition to these houses the Nawab constructed the celebrated buildings Munavar Baksh, Khurshid Manzil and the Chaupar Stables. The Awadh style was gradually abandoned during reign of Saadat Ali Khan and European innovations adopted largely. The result was that Lucknow became rendezvous for more distinguished people than ever before. In 1814 Nawab Saadat Ali Khan departed from life and was buried at his tomb with his wife ‘Khursheed Zadi’ in the twin Tombs of Qaiserbagh adjoining the begum Hazrat Mahal park. 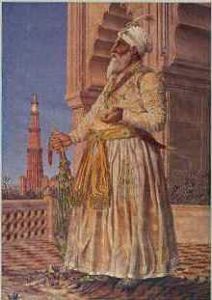 Ghazi-ud-din Haider ascended the throne in 1814. He got built two houses within the Motimahal complex, the Mubarak Manzil and Shah Manzil. He also introduced for the first time animal fighting sport, which was hitherto unheard in Lucknow. Ghazi-ud- din used to watch these fights from Shahmanzil, which took place on the other side of the river at Hazari Bagh. He got a European style house built for one of his European wife and named it ‘Vilayati Bagh. ‘ The edifice of Qadam Rasul was constructed near it. According to popular belief this impression of the supposed footprints of Muhammad on black stone, was brought from mecca, by some distinguished pilgrim. Though badly damaged in 1857, the stone bearing the footprint still stands, on a high pedestal near Sikandar Bagh (NBRI). Muhammad Ali Shah was 63 years of age when he ascended the throne. But he was an experienced man and had seen the glorious days of his father. He started to economize and set right the administration. He started building the Chhota lmambara. Muhammad Ali Shah was determined to make Lucknow into veritable Babylon and to leave for himself a memorial, representing him as greatest king of Awadh. He started building in the neighbourhood of the present clock tower, an edifice similar to Babylon’s minaret or floating garden & named it Satkhanda, but it reached only its fifth storey in 1842, when Muhammad Ali Shah died. 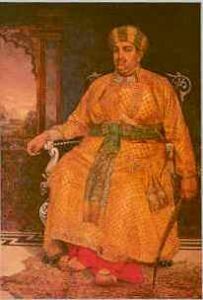 Amjad Ali Shah’s eldest son, Wajid Ali shah, who was eventually destined to be the last ruler of Awadh, ascended the throne of Awadh in 1847. 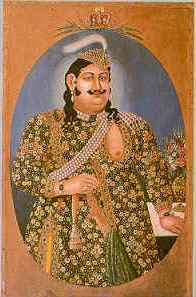 Wajid Ali Shah was a great patron of singers, musicians, dancers and artists. He was also greatly interested in architecture. He started building the Qaiser bagh palace complex as soon as he came to the throne. This vast complex was built between 1848 and 1850 at the cots of 80 lakh rupeesincluding furniture and decoration. The inner court yard of Qaiserbagh, with its lawns was called Jilo Khana. In the centre was a Baradari flanked by two mermaid gates ( Lakkhigate ) at eastern and western ends. On the right end was Chandiwali Baradari, which was paved with sliver and the khas muqam and Badshah manzil, which used to be the special residence of the king. On the left was a large group of buildings termed as chaulakkhi kothi, built by Azimutla Khan, which was later sold to the king. Nawab khas mahal and other honoured ladies of the royal harem lived here. During the mutiny days Begum Hazrat Mahal held court from this kothi. The buildings at the Qaiserbagh Quadrangle were occupied chiefly by ladies of the Harem. To left of the Western Lakkhi gate, was the Roshan-ud-daula kothi, built by Nasir-ud-din-Haider’s Wazir, later confiscated by Wajid Ali Shah and renamed as ‘Qaiser Pasand’. One of his favourite wives Nawab Mashuq Mahal used to live in it. Of the large oblong enclosure of elegant and imposing two storied houses, one wing of which was pulled down after the war of 1857, the other still remains. It was in this atmosphere of gaiety and merriment, that the British annexed Awadh on Feb.11, 1856 deposing Wajid Ali Shah.